Dojo guidance of "Imabari Kenyuukai"
"Ehime Nippon Kempo Renmei",Federation of Nippon Kempo in Ehime was born in August 1, 2006. 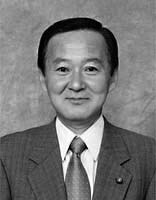 In the same year the first game of Nippon Kempo in Ehime was held on 3rd September. In April 30, 2007 we established our team named "Imabari Kenyuukai" as a branch of "Ehime Nippon Kempo Renmei". In April 1, 2008 we established our team named "Nippon Kempo Imabari Junior Sports Club"as a branch of "Japan Junior Sports Clubs Association". 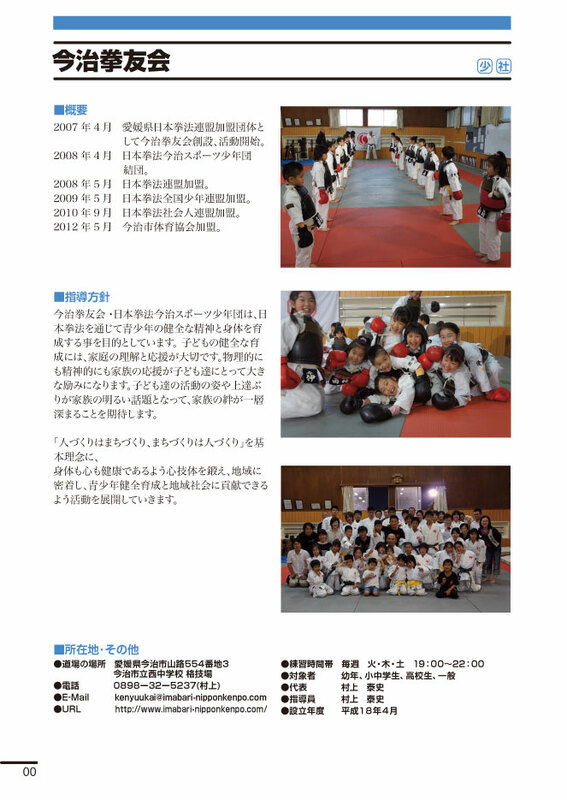 In May, 2008 we joined "Nippon Kempo Renmei" . In May, 2009 we joined "Nippon Kempo Zenkoku Shonen Renmei" . In September, 2010 we joined "Nippon KempoShakaijin Renmei". January 1, 2012. Itami Branch of "Imabari Kenyuukai" established. In May 29, 2012 we joined "Imabari-shi Sports Association". April 1, 2014. Iwakuni Branch of "Imabari Kenyuukai" established. Nippon Kempo has been developed as a combination of material arts of various fighting match,and has been applied in many areas,such as skills in arresting criminals for Japanese policemen and basic trainings of Japanese Self-Defense Forces. 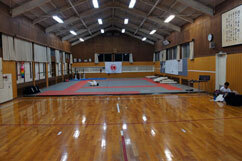 Now Nippon Kempo has become one of the most popular sports in Japan and you will find a club team in every university. In Japanese Self-Defense Forces where the members are required to cope with critical situations almost all the troops formed in every prefecture adopted the training of Nippon Kempo for their training. In Ehime Prefecture,however,only a few teams have just started their activities,and they are in a developing stage. Although almost all our team members are beginners,we share a mutual goal,and are acting together under our Action Policy,"Good societies will be created by good citizens and we will serve our society by encouraging people in our community. "Our goals are to realize traditional Japanese culture,to appreciate decorum,discipline,and faith,and to encourage both our physical and mental health through the training of Nippon Kempo. We will contribute our society by our club activities. 554-3,Yamazi,Imabari City Ehime Prefecture 794-0072 Japan. ※I may change training time and a training place . Please check schedule. 2-2-25,Gohon-cho,Imabari City,Ehime Prefecture　794-0823 Japan.